It is highly advisable to ignore DiscountLocator ads because they belong to third-parties, some of which may be unreliable. DiscountLocator ads are web banners, pop-ups, coupons, and special offers, and their content may be unrelated to the underlying web pages, your search terms, and browsing interests. It is so because DiscountLocator is sponsored by multiple third-parties, all of which seek to drive more traffic to their websites. DiscountLocator, which is installed as a browser add-on, is not malicious; however, its advertisements may redirect you to dangerous websites. 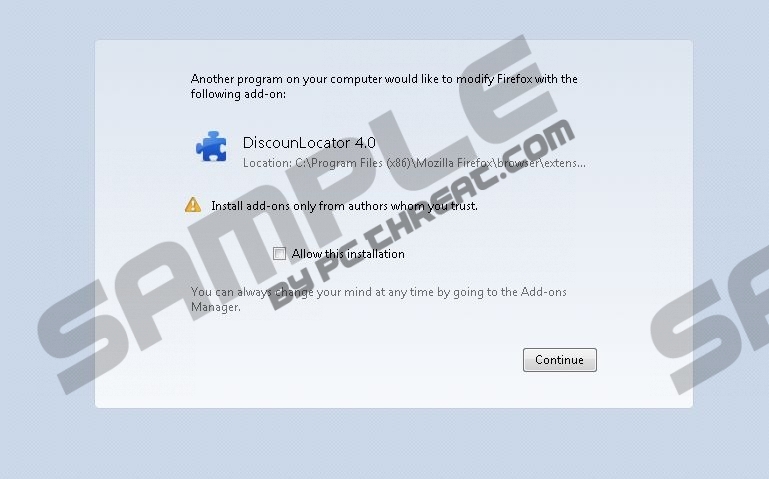 During installation, DiscountLocator may alter its name by capitalizing random letters or adding new ones to the name. As a result, you may find that you have installed a program named, for example, DISacountLaocatOOr. DiscountLocator is available at discountlocator.info and may also be bundled with some other programs. For example, you may encounter DiscountLocator when exposed to the DomaIQ installer, which is very often employed by wicked software distributors. DiscountLocator ads may pop-up on the screen after installing some software updates or programs downloaded from unreliable sources. It is highly advisable to review the license agreement provided by installation wizards because this is how you get the chance to prevent unwanted programs. Below you will find our instructions which will help you remove DiscountLocator ads from the browsers, but we strongly recommend that you use a powerful spyware and malware prevention tool. It is necessary to keep the computer protected against all types of threats. Adware programs such as DiscountLocator cannot inflict a lot of damage but other threats can, and you should shield the system from those dangerous infections. We recommend using SpyHunter because it can eliminate DiscountLocator ads for good and safeguard your operating system against computer threats. Move the mouse pointer to bottom-left corner of the screen. Right-click and click Control Panel. Select Uninstall a program and remove DiscountLocator. If you want to be sure that DiscountLocator ads are removed for good, implement a reputable scanner which is powerful enough to detect DiscountLocator. Click the button below if you want to try out our recommended scanner, which can easily detect the components of DiscountLocator. Quick & tested solution for DiscountLocator Ads removal.